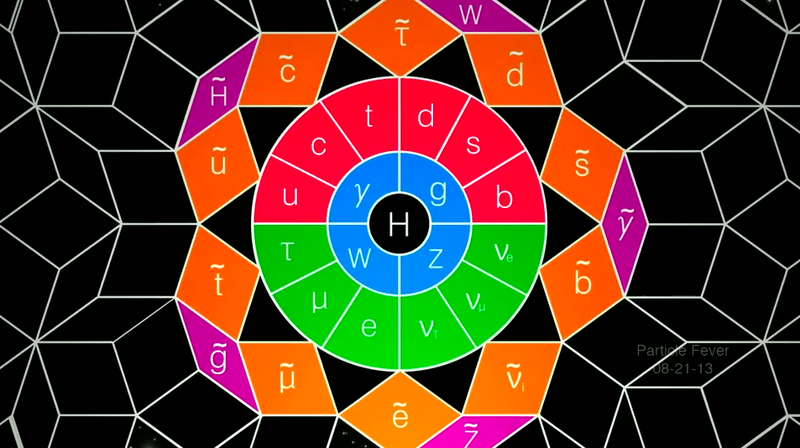 The original ideas for introducing supersymmetry dates back in the 1960s when, in the context of hadron physics that was found to be approximately spin-flavour independent, a symmetry between mesons and baryons was proposed. These ideas, largely ignored at the time, found their way through mathematical investigations related to string theory into particle physics in the 70s, where, with the development of quantum field theory, a new symmetry — supersymmetry — relating bosons to fermions on the basis of a consistent algebra was developed. Andreas Hoecker (ATLAS experiment) notes: “A long way was crossed from the first theoretical concepts, developed in parallel on both sides of the iron curtain, to formulating the phenomenology of supersymmetry”. SUSY phenomenology and predictions for experimental observations came in the later 70s with the development of the minimal supersymmetric standard model (MSSM) and the concept of the so-called “R-parity” the conservation of which would avoid proton decay. The MSSM not only duplicated the number of known particles by introducing the supersymmetric partners of the Standard Model fermions and gauge bosons, but in addition required two Higgs doublets, leading to five elementary scalar bosons, and their corresponding SUSY partners. A primary motivation for SUSY nowadays is its effect on the mass of the Higgs boson. One of the major weakness of the Standard Model is the presence of very large ‘radiative’ corrections to this mass. In the absence of any new physics, up to the largest energy scales where gravity would come into play, these corrections are much, much larger than the mass of the Higgs boson itself. And this makes difficult to explain the observed mass of 125 GeV. A new mechanism — e.g. a new symmetry — can lead to a natural cancellation of these radiative corrections. SUSY achieves just that. Another strong motivation for SUSY comes from the observation that the electroweak and strong coupling strengths seem to evolve towards each other with rising energy. Nevertheless, they do not quite meet at a single value, which would be the sign of ‘grand unification’ of the Standard Model forces. Such grand unification would not only be a beautiful generalisation of the Standard Model, but would also allow protons to decay, a property deemed necessary to generate the observed excess of baryons over anti-baryons in the universe. If SUSY materializes at energy scales of 1 TeV or so, it would modify the evolution of the couplings such that grand unification might be realised. And even more: the energy scale at which unification would occur would likely be large enough to push the lifetime of the proton beyond current experimental limits. Finally, the third argument in favour of SUSY is that, under certain circumstances, it offers a mechanism that could explain the observed dark matter in the universe. If “R-parity” and thus the number of SUSY particles is conserved (i.e. they are only produced by Standard Model processes in pairs) then the lightest SUSY particle (LSP) could not decay to solely Standard Model particles; it would thus be stable. If this LSP is neutral and weakly interacting, it is a perfect candidate for dark matter: it could even match the required amount of dark matter that has recently been precisely determined from the data of the Planck satellite. There remains but one question: what is the manifestation of the existence of SUSY in nature? The answer is striking: every particle of the Standard Model (SM) would have a supersymmetric analog or ‘partner’, which would be identical to the SM particle, except for its spin. Quarks, which have spin 1/2 would have scalar (spin 0) partners, called ‘squarks’; leptons would follow suit: they would have spin-0 partners called ‘sleptons’. The situation would be almost the same for the carriers of force; there is a technical difference with respect to quark and lepton partners, in that the physical SUSY partners of the SM bosons would be admixtures of states that include the Higgs SUSY partners. If supersymmetry were an exact symmetry, the mass of each Standard Model particle and its SUSY partner would be equal. Nature, of course tells us otherwise: there is no scalar (spin 0) particle as light as the electron, while also no other superpartners have been seen so far. Paris Sphicas explains: “This is where one has to introduce additional concepts, e.g. ‘breaking’ supersymmetry so as to make these partners much heavier than the standard model particles. There are several ways of doing this, and thus, one ends up with different ‘variants’ of SUSY. Having said this, even within any specific variant, there are still several unknowns, with the most important one being the precise mass spectrum of all the SUSY particles.” This is very important, because this spectrum governs the experimental signatures that would result from the presence of these SUSY particles. As an example, if A is heavier than B, then A can decay to other particles and B. And this is a totally different scenario than B being of higher mass than A. Another example is offered by the lifetimes: if A is short-lived we expect one set of signatures, which are very different from when it is long-lived (and in some case not decay even within the large LHC experiments). Summary of the dedicated ATLAS searches for top squark (stop) pair production (top figure) and CMS EWKino searches (bottom figure) based on pp collision data taken at √s = 13 TeV during Run 2 of the LHC. If one wants to tackle natural SUSY, which describes a flavour of SUSY that allows to moderate the hierarchy problem by cancelling the Higgs radiative corrections, one needs to search for light top-quark partners (top squarks, also denoted stop). Stop pair production has similar final states as top pair production with, however, additional missing transverse momentum from the two escaping LSPs but also much lower cross section (roughly six times lower if the stop had the same mass as the top quark). Highly optimised analyses searched for direct and gluino mediated stop pair production in all kinds of decay scenarios. These analyses have allowed the exclusion of stop masses of up to 900 GeV (for low-mass LSPs). It might also occur that strongly produced SUSY particles are too heavy for the current reach of the LHC and only electroweak SUSY particles are produced. Their signatures would resemble Standard Model multi-boson production giving final states with two or more leptons, only a few jets, and missing transverse momentum. Again, ATLAS and CMS have been looking for such events in highly optimised dedicated searches with, so far, no success. The lack of evidence has inspired the experiments to also search for SUSY in events with long-lived particles or relaxed of R-parity conservation requirement. Long-lived heavy particles are predicted in many new physics models, not only SUSY. Hoecker explains “Long-lived particles may occur if new particles can only decay through much heavier intermediate states (such as predicted in a SUSY flavour called split supersymmetry), in case of a small coupling strength (such as predicted in some gauge mediated SUSY breaking scenarios where the gravitino is the lightest SUSY particle), or if there is mass degeneracy in a cascade decay (as is present in some SUSY breaking scenarios).” The search for long-lived particles employs very interesting features of the detectors such as specific ionisation loss and time-of-flight measurements, or the reconstruction of highly displaced decay vertices, and usually requires dedicated reconstruction. Searches for R-parity violating signatures approach those for non-SUSY new phenomena such as hunts for bumps from resonances or events with many leptons or many jets, but no missing transverse momentum as the lightest SUSY particles are allowed to decay to Standard Model particles. As mentioned above, the way SUSY is probed at the LHC has evolved compared to previous experiments. Full ‘top-down’ models of SUSY that predict, based on a few but strong assumptions on the hidden SUSY–breaking sector, the entire SUSY particle spectrum and hence the experimental signatures, have mostly been replaced by so-called simplified models that take a more ‘bottoms-up’ perspective. Single SUSY processes are systematically explored in terms of the masses and mixing properties of the SUSY particles occurring in them. This allows the development of signature-based search strategies that, taken as an ensemble of many searches based on different simplified models, have been shown to adequately cover also full SUSY models. As Andreas Hoecker notes: “Simplified models are an extremely useful tool for experimentalists. They allow us to efficiently address particular features of SUSY such as stop/sbottom production, electroweak production, compressed spectra, massive long-lived particles, R-parity violation, etc. without the need to embed these in a complete SUSY model.” The term “compressed spectra” defines a particularly difficult, but theoretically well possible SUSY parameter scenario in which the produced SUSY particles have small mass differences. The consequence of such a configuration would be softer particle spectra and less missing transverse momentum. Searches for SUSY with compressed spectra need large data samples and will greatly benefit from the high-luminosity upgrade of the LHC. There has been a tremendous effort in trying to understand whether there are loopholes in the searches, that is, whether there are regions of parameter space (i.e. of mass values of the SUSY particles) that are below the experimental limits and yet would have escaped the searches. Such scenarios have been narrowed down with the increasing data statistics and ever-improving understanding of detectors and Standard Model processes. Searches for SUSY will benefit from the HL-LHC upgrade and, furthermore from a future high-energy hadron collider. Roughly, a 100 TeV collider would allow the experiments to probe SUSY particles that are ten times heavier than the LHC is currently sensitive to. So you may wonder will we ever know with certainty if SUSY exists or not? “Yes, the day we discover it!” answers Sphicas. As for the other case: just like we will never know that the proton does not decay (all we can ever show is that it decays more slowly than some incredibly small rate), it is impossible to show that something does not occur in nature. As to whether there are alternatives to SUSY? Here is a quick answer from Sphicas: “Of course there are alternative theories that try to tackle the same questions. Human imagination and more specifically the creativity of theorists have been shown to be boundless. The one thing that can be said about SUSY is that it seems to be the only one that could solve three issues for the price of one new principle. Of course, the stress here is on the words ‘seems to be’”. The author would like to thank Andreas Hoecker (ATLAS) and Paris Sphicas (CMS) for their invaluable contribution and thoughtful comments on this article. Latest public results for SUSY searches in the dedicated pages from the ATLAS (here) and CMS (here) experiments.